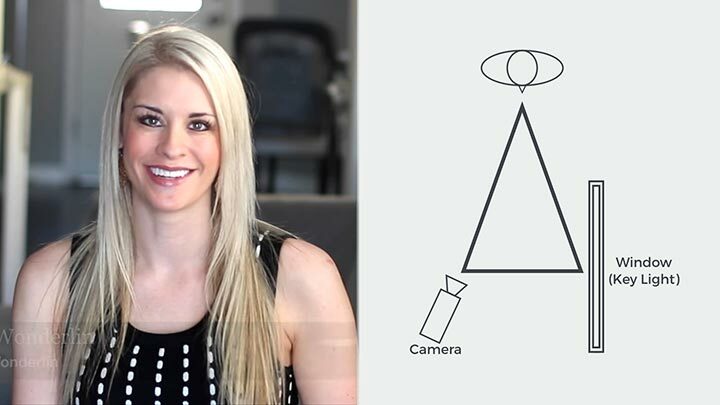 Here’s a simple video lighting trick that will make your videos look more professional. 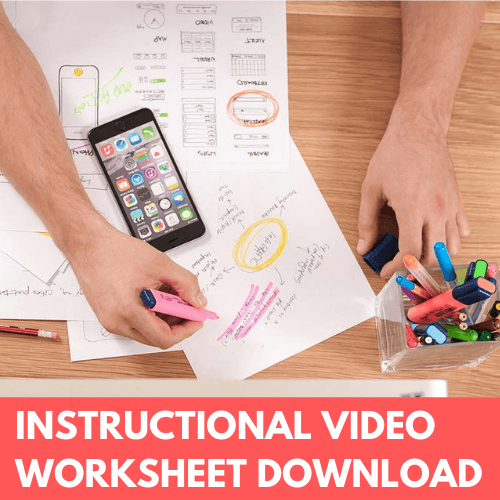 I’ve used this technique to light all kinds of professional videos – television dramas, documentaries, even animation. 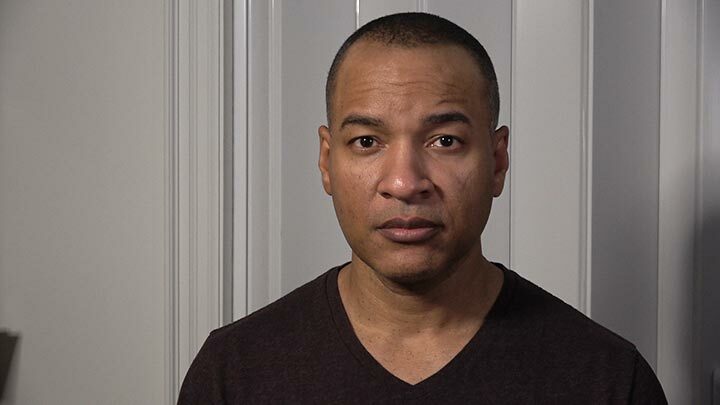 This “insider,” secret technique for video lighting works no matter what kind of lights you have. It even works with available light. Knowing this technique will save you a lot of frustration when trying to figure out how to light your on-camera shot. Well, maybe I only call it that. 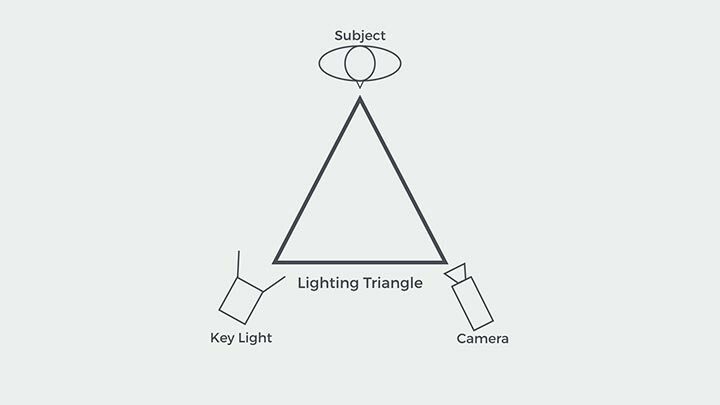 The three points of the Lighting Triangle. The elements at the points on the triangle are interchangeable. At the top point of the triangle, we have the on-camera subject. At the bottom-right point of the triangle we have the camera, which is focused on the subject. 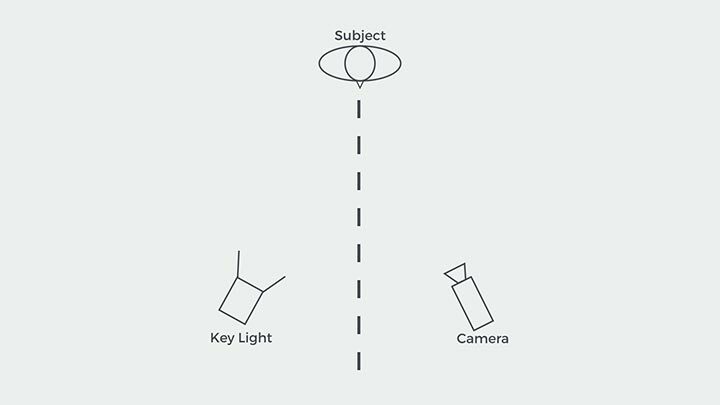 And at the bottom-left point of the triangle we have the main light source, or Key Light, also aimed at the subject. Proper Key Light placement creates depth. It also brings eyes forward, making them the focus of the shot. The screen grab, above, shows the real-life result of the Lighting Triangle. 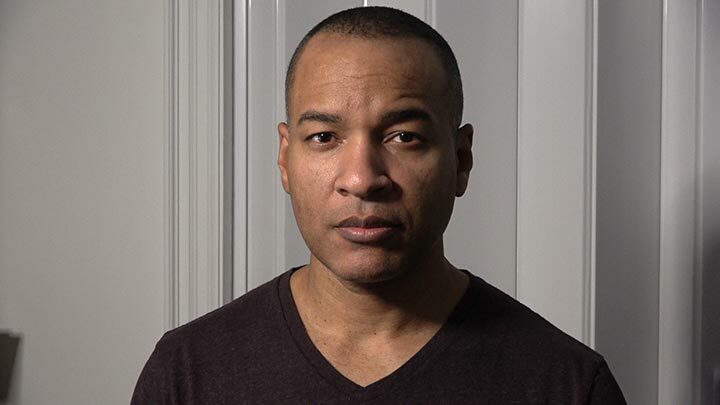 What you see is the foundation of professional video, film, and photographic lighting. Why? It makes the subject look three-dimensional, which is pleasing to the eye. The shadows formed by the Key Light give the face form and depth, and accentuate pleasing facial features. It also also brings the eyes forward, making them the focus of the shot – which is what you want to do. 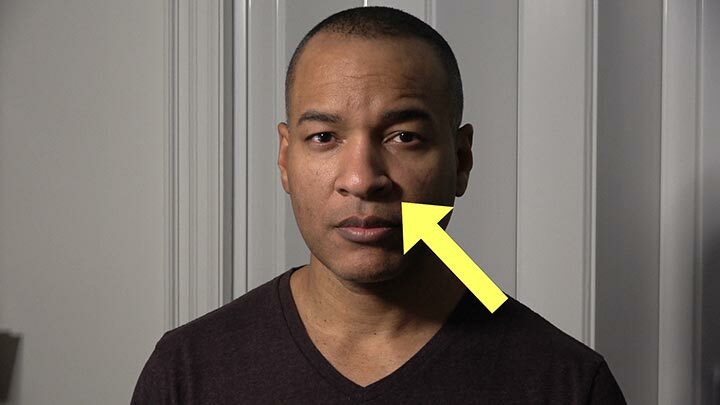 Proper positioning of the Key Light produces a shadow just off of the nose that angles down at about 45 degress. A couple of tips for the placement of your key light: You want to angle your key light so it illuminates the front of the face and starts to fall off around the opposite temple area. In terms of the height of the key light, you want it aimed down at such an angle that it creates a 45-degree shadow just a bit off the nose. A low-intensity light source is placed opposite the Key Light to fill in the shadow area. The shadow opposite the key light can sometimes be dark. Depends on the amount of ambient light in the scene. A dark shadow creates a more dramatic look. If that’s not what you’re going for, you can lighten, or fill in that shadow area a bit with a low-intensity light on the other side of the subject, called the “fill” light. A piece of white foam core mounted on a light stand makes for a cost-effective bounce board. 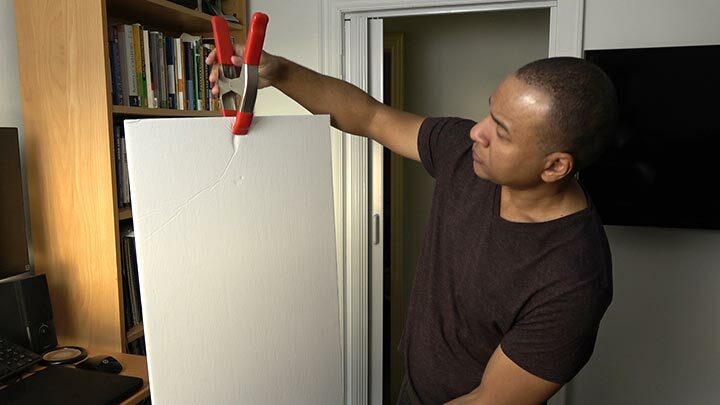 You can avoid setting up a fill light by using a piece of white foam core fastened to a stand. You can get foam core pretty cheap at your local craft store. Just angle the foam core to bounce some of the light from the Key into those dark shadow areas. Don’t fill in the shadow area too much, or you’ll lose the “modeling” effect, and your image will look flat. To achieve the modeling effect make sure the on-camera subject is placed between the Key Light and the camera. 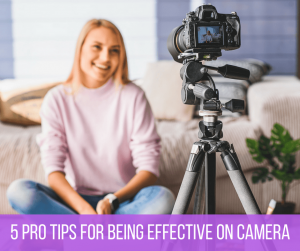 A good way to make sure you’re applying the Lighting Triangle correctly is to make sure the on-camera subject is positioned between the Key Light and the camera, and that the camera is positioned on the shadow side of the subject. An example of the Lighting Triangle being used with available light from a window. You can use the Lighting Triangle principle with available light, too. The image above shows my friend, Kelly Wonderlin, in one of her YouTube videos. Notice how she’s positioned herself at the top of the Lighting Triangle, with the available light from the window on the bottom-right point of the triangle, and the camera at the bottom left point of the triangle. As you can see, the camera is on the shadow side of Kelly’s face. Makes for a pleasing shot. Well, there you have it, the Lighting Triangle. 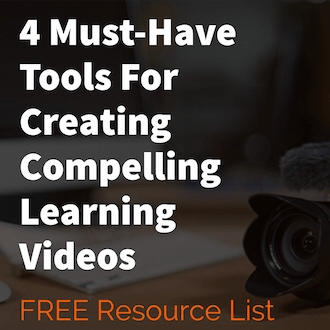 Take it, and use it to make your on-camera videos look more professional.